How to Create Secure Office Chat Between Android and Windows? How to Create Secure Office Chat Between Android and Windows Devices? Nowadays, the users are more concerned about their conversations remaining private. Well, aptly put, the people expect their communications to remain encrypted. And if the conversation is related to business, you need to create a secure office chat between the teammates. So, even if an attacker manages to get access to the conversation, he/she would be able to see some gibberish form of data which would not make any sense. Several private messengers are offering secure messaging services. They claim that they do not store anything on their server, nor they can access your encrypted chats even if they want. So, do you believe them? I would suggest not doing that. It’s simply because almost all of them aren’t open source projects. If you can’t review them, how can you trust them with your data? Well, that’s just me. Fortunately, there’s an alternative to these messengers if you want to make use of something for your office. And, in this article, we’ll be reviewing it. What’s More Secure Compared to an Open Source Project? Well, arguably, an open source project proves to be the most secure environment (as Linux distros are). But, what if something works locally? What if something does not require 3rd party servers to facilitate messaging? If we could find an application that would simply facilitate secure messaging service utilizing a Local Area Network, it would be great, wouldn’t it? 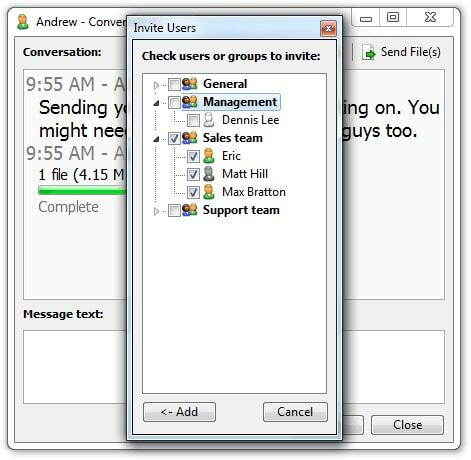 As simple as it goes, Softros Lan Messenger is an intra-office messaging client. It does encrypt your conversations. It is an easy-to-use solution which would ensure a better privacy with your business office communication and a compelling alternative to some of the most famous office messaging clients out there. You can download it here: http://messenger.softros.com/downloads.html It is available for both Windows & Mac. Also, you can get it for your Android device absolutely free. It is available for both Windows & Mac. Also, you can get it for your Android device absolutely free. Let us now move on to review the Softros Lan Messenger. Before talking about the security and the working of Softros Lan messenger, we should get to know the features. Is it worth getting for your office? Let’s find out. Serverless Architecture: Unlike other instant messaging clients, Softros messaging mechanism does not need an external server. In fact, it does not depend on a server at all. It is a peer-to-peer based application. So, there’s no one to handle your data, only the system you’re sending from to the system which receives it. There’s no other justifiable place where you can expect your data to be stored. So, we encounter fewer risks of exposure of your data to the Government or any third party services. Offline Use: As it works through a local area network, you can even send a message to a peer which is offline. The message gets delivered as soon as he or she comes online again. So, it’s suitable for a pleasant offline experience. Group & Individual Options: You can have a conversation with an individual user or with multiple users at a time. It also provides you the ability to send a broadcast message to a group of people, which is convenient at times. Remote Desktop Sharing: If one of your colleagues needs help in setting up something on his workstation. Without wasting any additional time, you can utilize the remote desktop sharing option to assist your colleague whenever there is a need for it. Terminal Services Support: Normally, we like to the term some of the remote desktop services – “Terminal Services” as well. So, it simply supports Microsoft and Citrix Terminal service environments. Import/Export User Settings: To prevent losing your conversational data or preferences, you can simply export the user settings. If you ever perform a clean wipe of the system, you can use the export file to import the previous user’s settings to get started. User Access Control: As an administrator, you can control the access to all of the features that Softros LAN Messenger offers. In other words, you get to control what a user should access and what it should not. 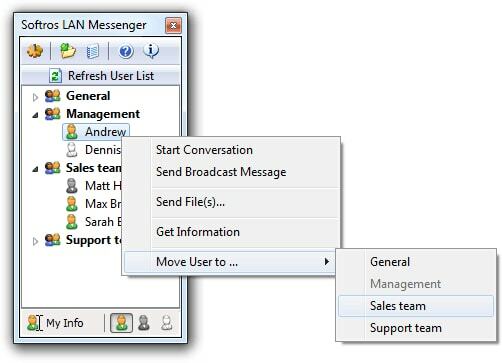 The Softros Lan Messenger offers a quite simple user interface. Although it seems to look like a standard messaging client, it proves to be very easy to use. It’s almost impossible for a user to get confused with the options offered by the messaging client. Despite having a lovely old user interface design, it’s fun to use when you are confident enough that you already know where the options are. It would almost feel as if you are using a built-in Windows Messenger to communicate. When you’re using it on your Android device, it presents you with a material design, the user interface which looks just fine considering that you’ll be using it for your office only. The Softros LAN messenger is just 10.43 MB in size (for Windows – as .exe file). In contrast, it’s just 2.19 MB in size for Mac. If you’re looking to install it on your Android device, you’ll be glad to find that it’s merely around 2 MB in size. It mostly runs in the background. So, you’ll have to be extra careful whether it is a resource-friendly client or not. 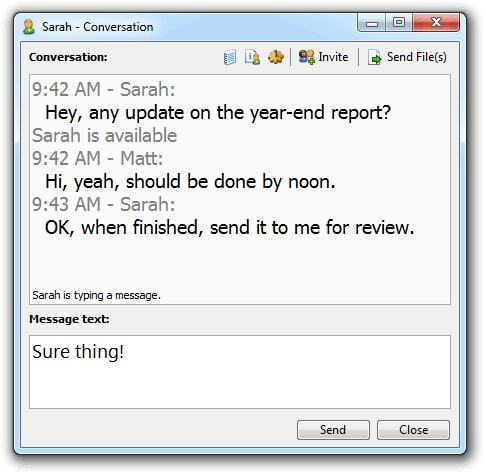 In this case, it is a light intra-office messaging client for Windows & Mac. Even if you own an outdated system (considering that it is compatible with the OS installed), it will work just fine. Being a locally encrypted messaging client, it looks to be one of the most promising messaging clients for office use. It’s also cost-effective at the same time when compared to its competitors. The LAN chat software encrypts your communication data with one of the highest encryption standards (AES-256). It protects all of your messages and the files (if any). It also takes care of the situation where hackers won’t be able to trace it, nor let IM works affect it and compromise its security. Softros Lan Messenger is a quite powerful messaging client. Irrespective of how big your office is, it’s a viable solution for your business. It’s light, secure, and affordable. LAN Messenger is a quite powerful messaging client. Irrespective of how big your office is, it’s a viable solution for your business. The messenger could come handy in a variety of situations. It’s very suitable for a typical small sized office, a school, an institution, or a big shot office where everyone’s connected to the same network. TRP Guides: How to Send a Text Message from PC?